This is super easy to make. Give it a try if you like pumpkin! Using a 9-inch springform pan. Mix together the rum and maple syrup. Beat the whipping cream until you get stiff peaks, adding the powdered sugar in little by little as you whip the cream. Add the mascarpone, pumpkin, and pumpkin pie spice and beat until blended. Cut the lady fingers to a height of about 2 3/4 inches long and lightly dip each side in the rum mixture. Stand the cut lady fingers upright to line the sides of the pan. Dip more lady fingers into the rum mixture, and line the bottom of the pan, cutting to fit as needed. Spoon half the filling over the lady fingers, then sprinkle 3/4 of the ginger snap cookie crumbs on top. Make another layer of dipped lady fingers on top of the pumpkin mixture, pressing in lightly as you go. Spoon the rest of the pumpkin mixture on top of the lady fingers, smoothing the top. 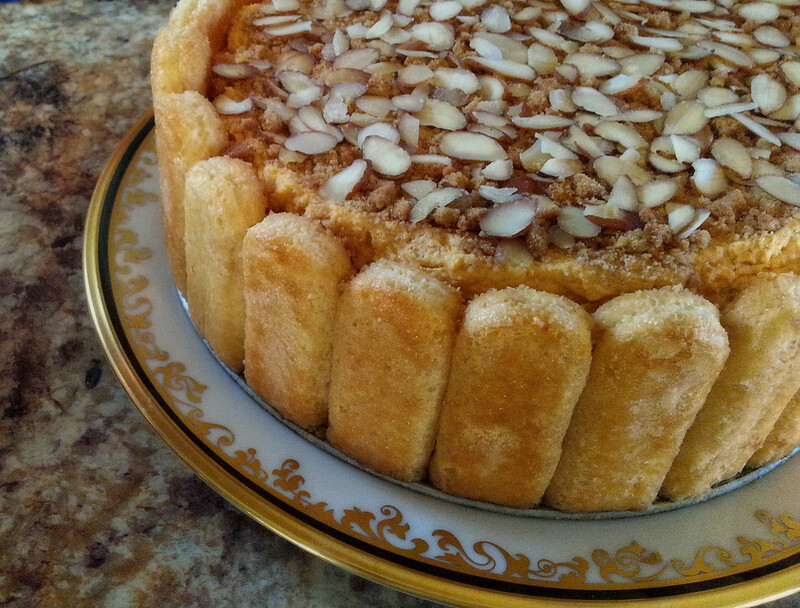 Decorate the top with the remaining ginger snap cookie crumbs and sliced almonds. To unmold, first run a knife around the inside of the pan and remove the side. Carefully move the tiramisu onto a platter and serve. Enjoy! This entry was posted in Uncategorized and tagged dessert, pumpkin, tiramisu. Bookmark the permalink. And there are no calories. I think I have to try it. None at all Valerie! 😉 Taste the filling. 3/4 cup powdered sugar was ok for me (not too sweet) Just add more if you want it sweeter. You outdone yourself on this one Carol.